The use of old shipping containers has gained its popularity in Asia. First of all, it is relatively less costly than the usual building bricks and glass. For less than 2,000 dollars you get a ready-made room, an entrance, a small window, lights and an in-built ventilator or small air-condition. If the containers were to be made into a residential accommodation, you will need to install plumbing, a small kitchen, a toilet and shower area and that should be less than 20,000 dollars (pricing excludes furnitures, in Asia). Containers were used for housing for foreign workers, but its ‘Gypsy – normadic’ housing condition was subsequently banned in most parts of developed nations in South-East Asia. The six-pieces large reuseable steel material were then introduced as temporary classrooms, and it is still the most common low-cost structure for classrooms in developing countries. Here are a few examples of containers for enterprises, and in recent years, architects and interior designers have integrated containers as part of living and enterprise building blocks. It is no longer a substitutional element for a pop-up gallery or as a temporary premise. Deck, in the evening, Singapore ( Event: Cuckoos and Sparrows, 2016). 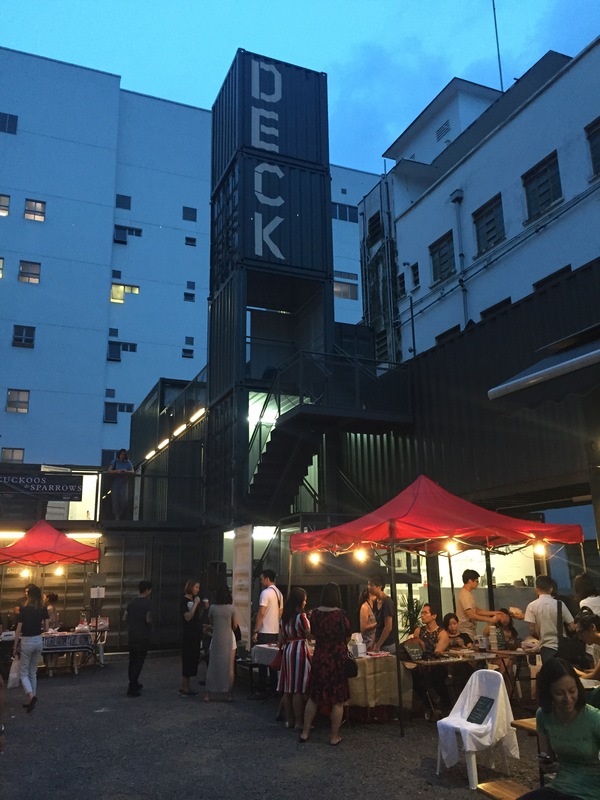 The Deck is an independent art space situated in Rocher compound with good proximity to La Salle College for Arts and Design, and Nanyang Academy of Fine Arts. Multiple containers were stacked upon one another and next to each other. There is a small cafe/bar on the ground floor, and the space is available for rent for art events. And a huge space for eatery and pop-up markets is available right at its entrance. Bridal Gallery, di Gio, Malaysia. Housing by Vipp, Sweden/ Denmark. We are looking for new commissioned projects which involve containers, and we would like to see more of this recycled materials in Asia. Also, to disregard potential confusion of our published content such as plagiarism and to avoid potential fake errorist, stay tune to our published materials and shall there be a duplicate of our works elsewhere we can’t help but to accept it as a form of compliment. *Featured image from Vipp Shelter.